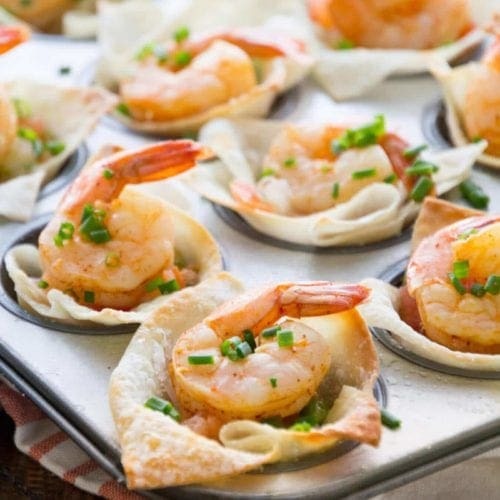 Light Tex Mex Shrimp Wonton Cups Recipe ~ Perfect Small Bite Appetizers! Crunchy Wonton Shells Stuffed with Pico de Gallo, Guacamole, and Seasoned Shrimp! Plus, it’s a Light Appetizer So You Won’t Feel Guilty! Bet you thought you were going to tune in today to some more delicious Christmas Cookies, but I surprised you didn’t I? 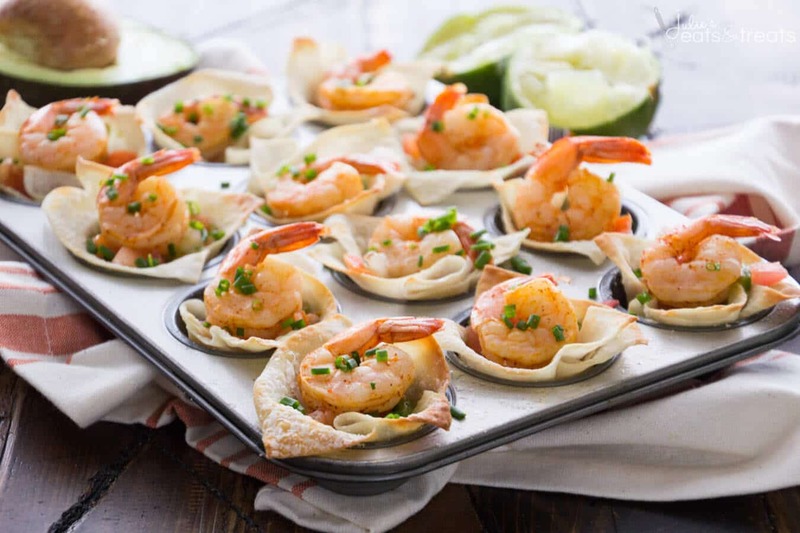 Today you are getting these oh, so delicious, Light Tex Mex Shrimp Wonton Cups perfect for your holiday and cocktail parties and game days! Light, crunchy wonton shells layered with gaucamole, pico de gallo and chives will have everyone coming back for seconds. Plus, they are super easy to make! I thought shrimp was a total win for everyone. You see I adore shrimp as you can see from my blog. 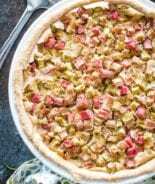 For example you can enjoy it on a pizza like this Shrimp Macaroni and Cheese Pizza! Or maybe you’d like it with some pasta? 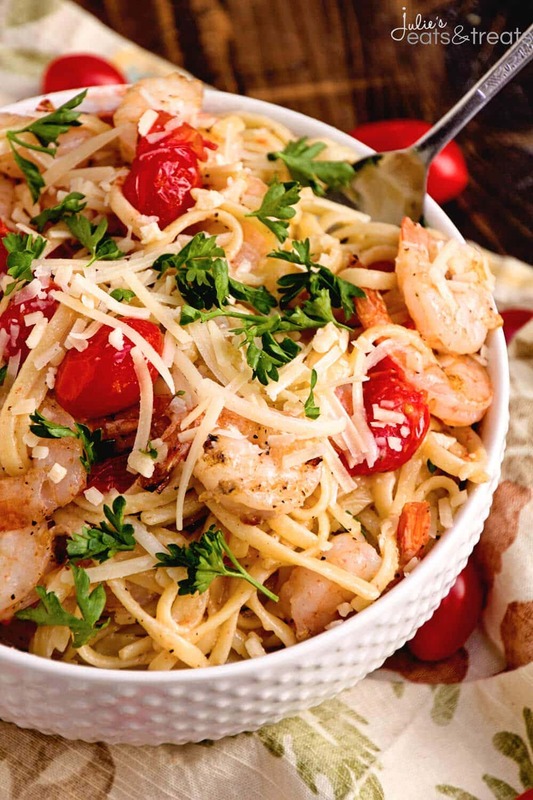 Then I know you’d love Shrimp & Asparagus Pasta! 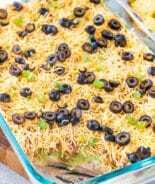 Or maybe you need a second appetizer for your party! Then Grilled BBQ Pineapple Shrimp Bites are a win! I’ve talked with you before about how I love the sweets at the holidays, but the appetizers are really what is near and dear to my heart. One Christmas we had a party and it was ALL appetizers with a few cookies snuck in. I mean we have to have cookies, duh! But that is my kind of holiday food. Or maybe you are hosting a big party for the football game. 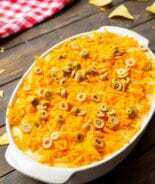 I’ll be belling up to the appetizer table whatever party we are at! Since I already know I love these Green Pepper Sausage Wontons so I wanted to try another wonton recipe! Shrimp is a weekly occurrence in our house. 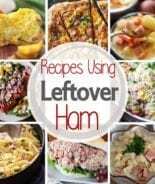 I love how easy it is to make, plus there is endless options for different dishes. 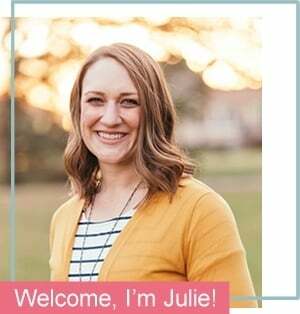 My hubs love it as much as I do and so does Miss K! 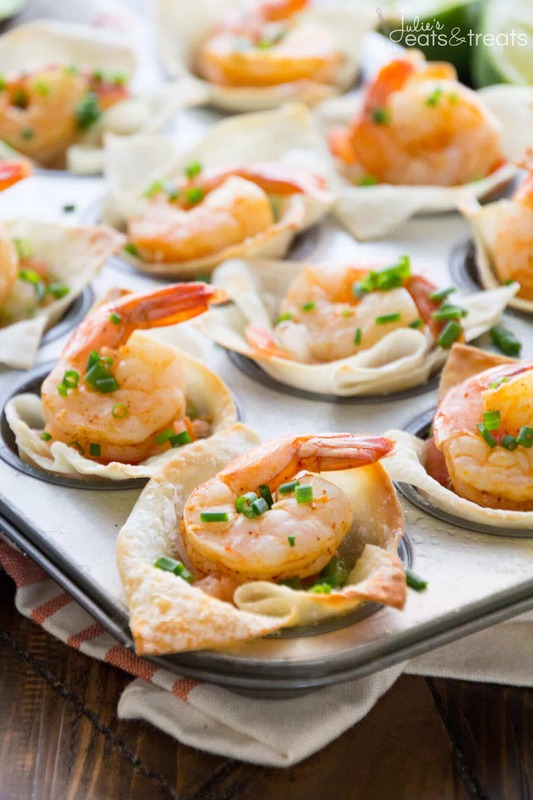 When I made these fantastic Light Tex Mex Shrimp Wonton Cups my Mom happened to be over. They may be small bite appetizers but we treated ourselves to them at lunch and devoured more than I care to admit. You see, my mom is more used to meat and potatoes, Midwestern staples, and I love having her over and treating her to some new flavors. As I was making them she may have raised her eyebrows and doubted me for a second, but I promptly ignored this. Let’s just say after they were done she was oohing and ahhing and complimenting me on how delicious these shrimp appetizers were. Of course, that’s a great thing to have happen when you are cooking, but the true test is always if they eat them. We’ll just say she devoured them and I knew they were a success! They are also super easy to make so you don’t have to be slaving over them when your guests arrive! 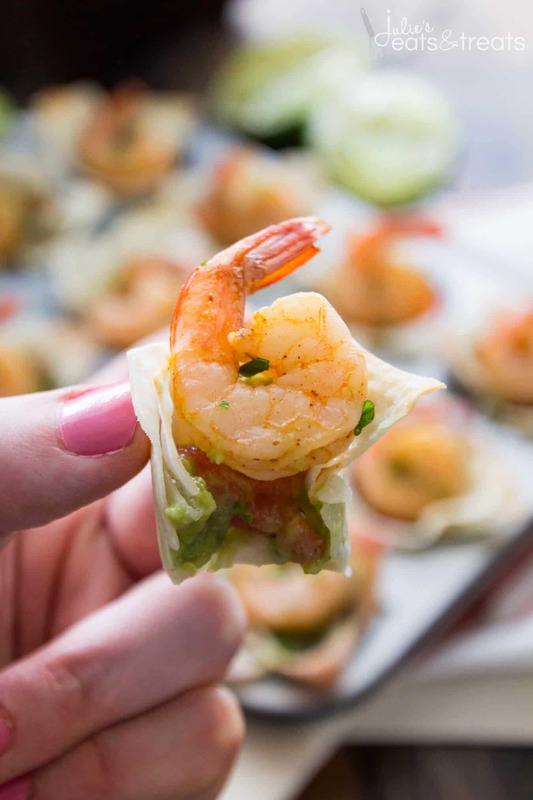 Simply bake the wonton shells, which can totally be done ahead of time, then layer in the guacamole, pico de gallo and top them with your seasoned shrimp! 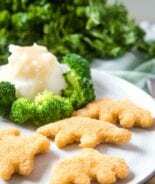 They are so delicious and flavorful that I’m sure they will disappear in a second, plus who doesn’t love those cute small bite appetizers like this? 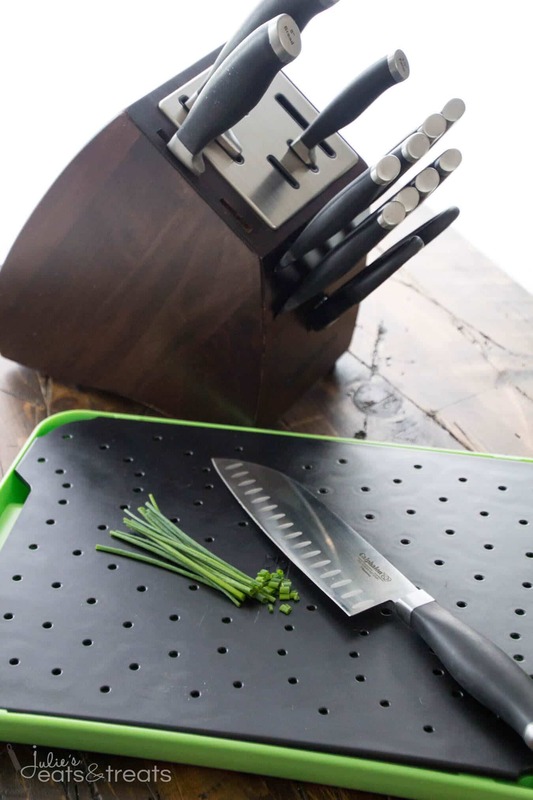 Don’t forget to grab your Calphalon Contemporary Self-Sharpening 15-pc. Cutlery Set with SharpIN Technology to dice a few chives up and top the wontons with them for a great presentation! You’ll look like you are a chef in a five-star restaurant when you present these at your cocktail party, but don’t worry I won’t tell them how easy they were to make! Are you on a the market for some new knives? Great knives are a must have in the kitchen. They truly make preparing food an enjoyable experience. A good knife set can make all the difference! Calphalon is a great quality brand so I knew that I would love these knives! This set features a block with built-in sharpeners that automatically sharpen straight edge knives with every use so you don’t need to worry about it! It includes a great assortment of knives for all your food prep tasks, including dicing, chopping, and slicing. Plus, eight steak knives! You know what I loved most about it? The ends of the knives are labeled so you know exactly which one to grab when they are in the block. I hate having to grab every single one before I get the right one when I need it! *I was given a Calphalon Contemporary Self-Sharpening 15-pc. Cutlery Set with SharpIN Technology and compensated by the National Shrimp Council for this post. As always, all opinions are my own. 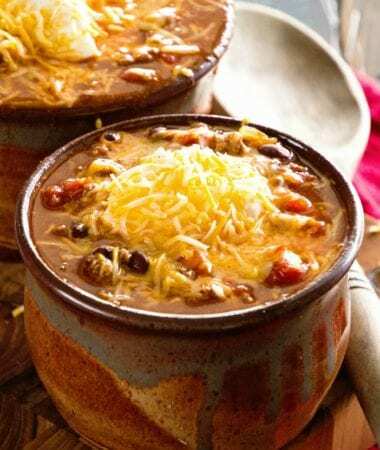 Put these on the menu for your next party and everyone will be happy! Perfect Small Bite Appetizers! Crunchy Wonton Shells Stuffed with Pico de Gallo, Guacamole, and Seasoned Shrimp! Plus, it's a Light Appetizer So You Won't Feel Guilty! Spray wonton wrappers with non-stick cooking spray. Arrange in 24 mini muffin cups. Bake in preheated oven for 5-7 minutes or until edges are just starting to brown. Remove from oven. While wontons are baking toss the shrimp with 1 Tbsp olive oil, salt, lime juice and chili powder. Cook in skillet over medium heat, about 5-7 minutes or until they are opaque throughout. Fill each wonton cup with gaucamole, then pico de gallo and then top with one shrimp. Sprinkle chives on top of shrimp. Looking for More Great Shrimp Dishes? 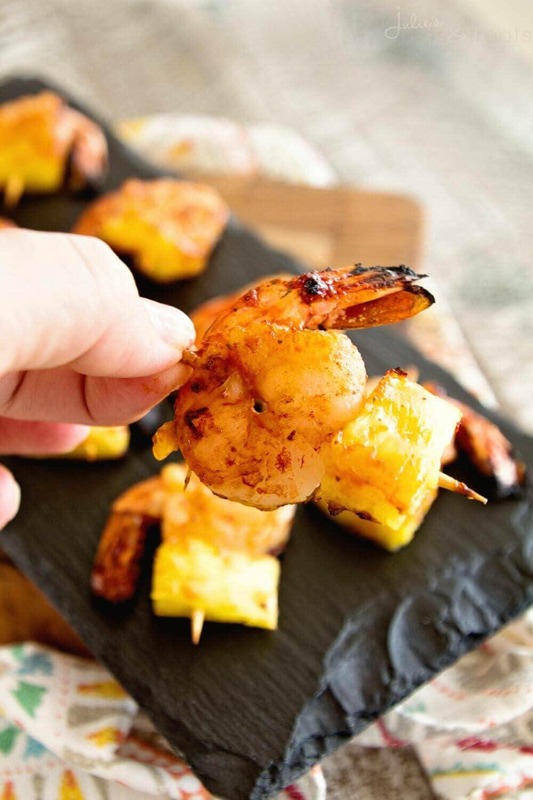 Grilled BBQ Pineapple Shrimp Bites ~ Delicious, Grilled Pineapple and Shrimp Bites Seasoned with BBQ Seasoning and Sauce then Grilled to Perfection! Lighter One Pot Lemon Shrimp Alfredo ~ Delicious and Easy Lemon Shrimp Alfredo that has been Lightened Up and Made in One Pot! 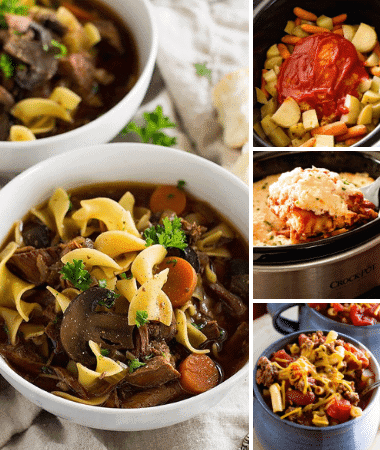 Perfect for the Weeknight! I’m with you 100%, appetizers are the best, and these shrimp wonton bites look out of this world! Your Light Tex Mex Shrimp Bites Recipe looks really good. One question (so far), when you buy the shrimp, do you get the pre-cooked? I usually get these when I make shrimp cocktail for parties, at Costco or Sam’s Club. Would I use the same ones? Thank you. I am looking forward to trying these and possibly fixing them for my niece’s bridal shower in November. Yes precooked! Those would work Jill! Hi! I want to make these for a party I’m having and I’m wondering how early I can make the wontons ahead of time. I feel like when you bake them they basically turn into chips, so they’ll be fine if I make them on a Wednesday for a Saturday night party. Hey! It’s from GIR kitchen products but I can’t find it so I’m not sure they make them anymore! Hi. Your recipe looks delicious but I’m confused. The ingredients lists 2 tbsp. Olive Oil, but the instructions only refer to 1 tbsp. Where is the other tablespoon used? It should just say olive oil! I’ll get it updated!